This container is produced with the technology of double injection moulding therefore the border of the base can be made of a different colour or material ,than the base. This way we obtain an aesthetic effect in case of a different colour or a very nice feel to the touch if we use a soft material like for example rubber.The opening is by button which is produced all in one piece with the inside. The lid can be fitted with a mirror, or otherwise may have the base coloured and the lid transparent. 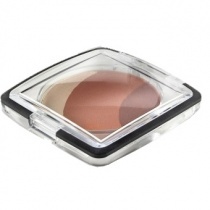 The insert snapped in the base is produced in different versions like 59 mm for compact powder, ½ diameter 59 mm for blush or duo eyeshadow. The lid is decorated by hot stamping. The materials used are SAN, polystyrene or ABS. Base, lid and insert are supplied separately.